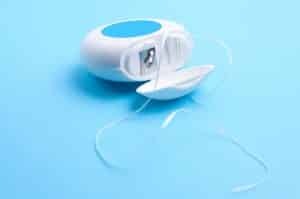 Do you think the correct way to floss is simply slipping the dental floss in between your teeth and quickly pulling it out? It’s not. There is actually a correct way to floss. If you don’t floss correctly, you can damage your teeth or gums. Also, if you don’t floss effectively, you are simply wasting your time. Flossing is an important step to keeping your gums and teeth healthy, so you may as well floss the right way. Step #1: You should use about 18 inches of floss, not only so you can keep feeding clean floss through your teeth, but so you will have enough to wrap around your fingers as well. Step #2: Wind the floss around the middle finger of each hand, leaving some slack for flossing between your teeth. Step #3: Use your thumbs and forefingers to steady the floss. Step #4: Guide the floss between your teeth and gently rub up and down against the sides of your teeth. Step #5: Up near the gumline, curve the floss into a C shape and gently slide it into the space between the gum and your tooth. Step #6: With the floss tight against the side of your tooth, gently rub with an up and down motion. Step #7: Repeat these steps for all of your teeth, including the back side of the last tooth on each side of your upper and lower dental arch. Do not reuse the floss.